blanket ad belt are separated. Adopt simultaneous shaft adjustment and pressure balancing shaft to make sure the pressure on the blanket is consistent with that on the heating roller, Thus completely solve the problem of cooling the blanket while turning off the machine or while power off, and give more protection to the blanket and extend its using life. Advantage of Our Heat Transfer Machine: The latest style of Sanyi digital thermal transfer machine is a major breakthough of the digital thermal transfer machine. It has characteristics as follows : 1. Phripheral temperature rising is fast and heating is more even. 2. The operation efficiency is 2-3 times than before. 3. Low noise and stable speed. 1. this SUS heating hose heats oil directly at the higher heating speed, reaching 200℃ within 45 minutes 2. it is equipped with external oil box which makes it convenient to add heat conduction oil, it has high security performance with the unique advantage of anti-explosion through automatic turn off. This machine is newly developed in 2012, improved from the original model of “down delivery” to the “Up delivery”. 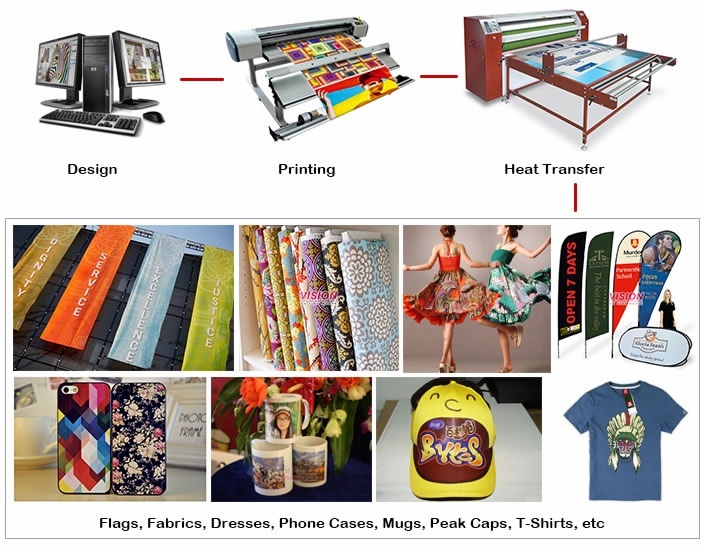 Therefore, it is more convenient to transfer printing on clothing and cuttings with more accurate location. Using the pneumatic pressing or hydraulic press for wool blanket marks the color of the products darker, and brighter, which greatly speed up the transfer printing. Specifications: There is external tank connected to the oil drum to fill the oil drum full. Full oil drum improves the stability of oil drum temperature. It makes sure that density of color is the same throughout the large format fabric. New Rotary Heat Press 100% full oil drum is excellent for roll-to-roll transfer. Moreover, heating power (working) is 20% lower now. It helps sign producers reduce the electrical cost.